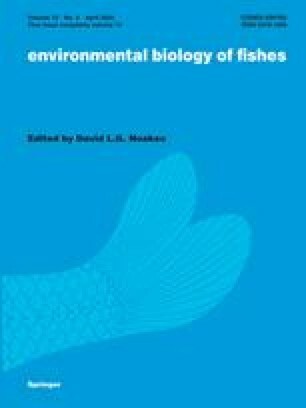 I investigated aspects of the early life history of Murray cod in the Broken River, southern Murray-Darling Basin, Australia. I documented patterns in abundance, length, age and the amount of yolk of drifting free embryos and estimated spawning periods for adult Murray cod in two reaches throughout each breeding season between mid-October and mid-December from 1997 to 2001. Free embryos began drifting in late-October and continued until mid- to late-December. Abundances of drifting free embryos showed no obvious peak in most years and were unrelated to discharge. Length, amount of yolk and age typically varied with sampling date, but only age showed strong and negative correlations with temperature. Thus, it appears that temperature affected rates of development, and that developmental stage, not length or age, was likely to be the determinant for when free embryos left the paternal ‘nest’. Most free embryos were estimated to have spent between 5 and 7 days drifting. Spawning of Murray cod in the Broken River usually commenced in mid-October and continued until at least early December. Initiation of spawning was associated with temperatures of 15°C and above, but discharge was highly variable, and no other environmental variables were consistent across years. The mid-point of spawning – usually in the first week of November – is considered a more significant time, because it likely coincides with peak spawning, and conditions during and immediately after this time are expected to be optimal for the survival of eggs and free embryos.